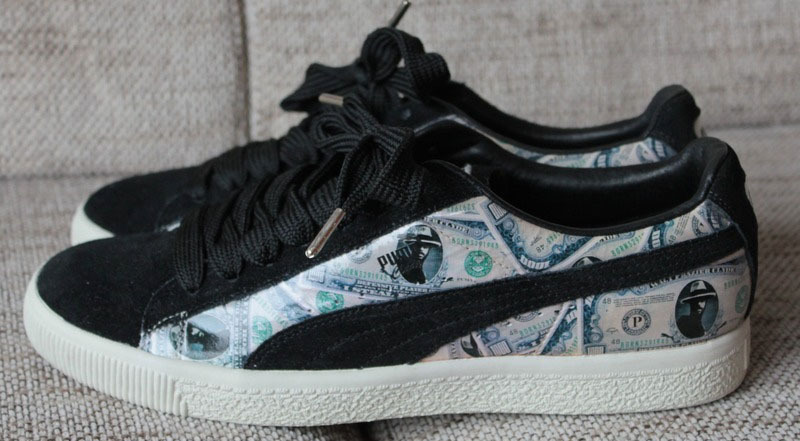 Dollar bills generally make for one of the more tacky prints in fashion, but it’s somehow had a decent rate of success in sneakers. Every notable brand has experimented with the use of money graphics, some taking a subtle approach, while others ease off of the chill button an opt for an all-over application. 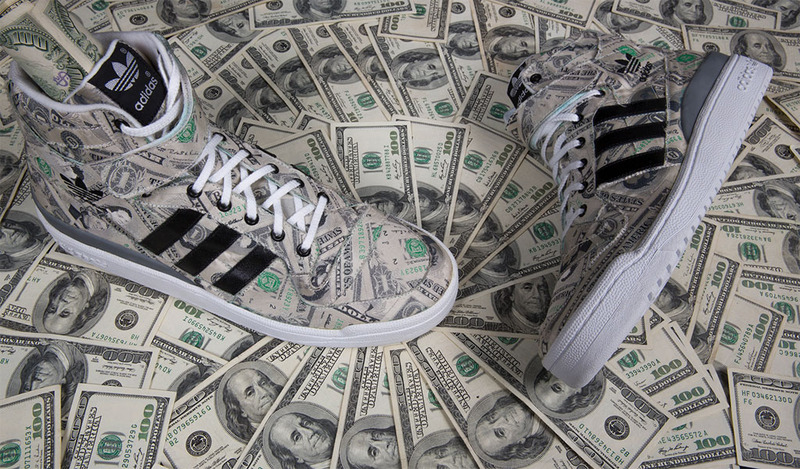 It’s no surprise that eccentric designer Jeremy Scott sparked the trend when he teamed up with adidas for the “Money” Forum Hi in 2002. Tomorrow is National Dollar Day, a celebration of the day the U.S. monetary system was established by the Continental Congress in 1786. 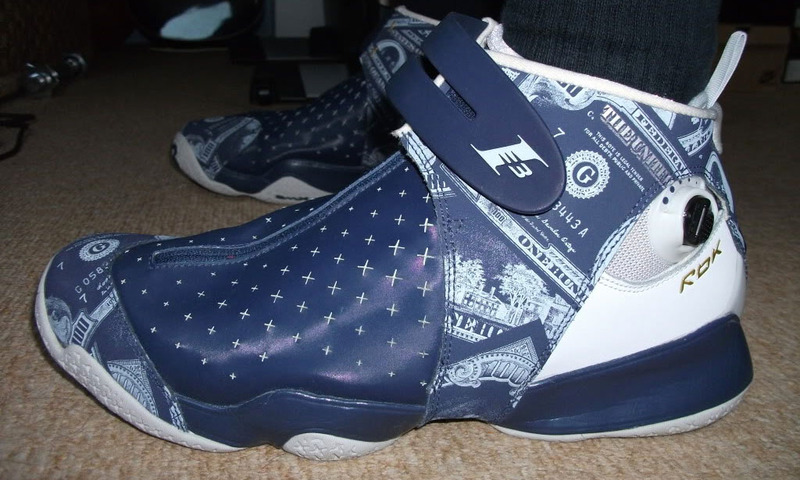 And now that we’ve imparted that knowledge (or Googled it), here’s a rundown of sneakers that have flashed some cash. 13. Hasbro x Reebok Courtee Mid "Monopoly Money"
Monopoly's ties to the sneaker game didn't start with the recent introduction of a Nike Mag piece. 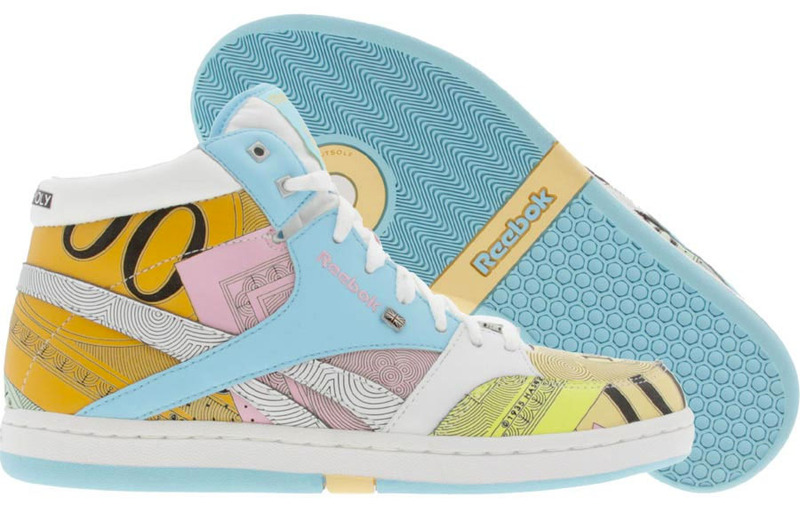 In 2008, Hasbro teamed up with Reebok for a full collection of Monopoly-inspired footwear, including this version of the women's Courtee printed in the game's famous bills. 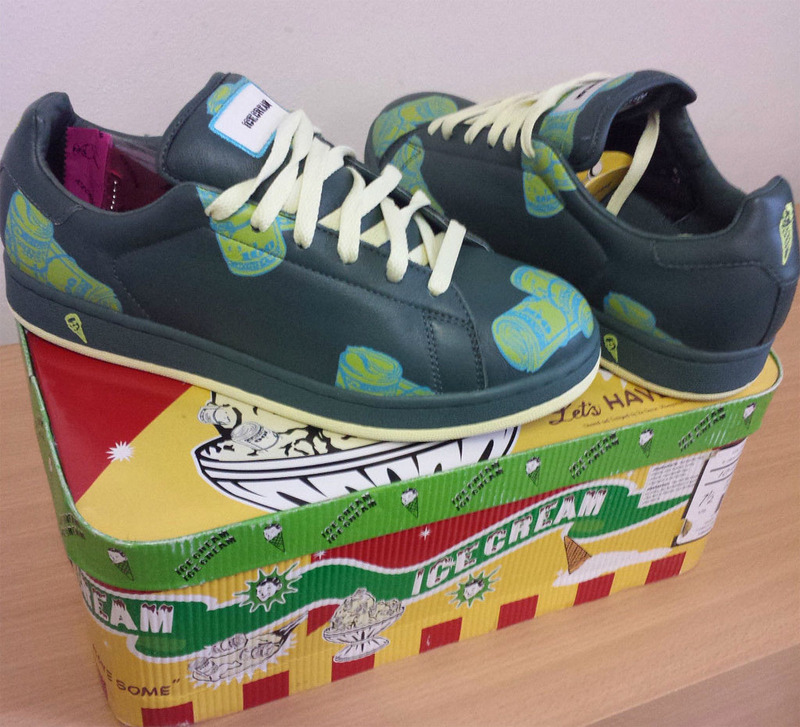 It's hard to believe that Ice Cream sneakers were ever a thing, and this is a prime example of why. Not to be outdone by the "Beepers" version, this was just one of several "Money Rolls" colorways that dropped. There's no fancy Lunarlon cushion or updated canvas, but this take on the original Chuck Lo is straight cash. Walt "Clyde" Frazier was the first player to sell hoop hopefuls on the appeal of the NBA lifestyle in the 70s. 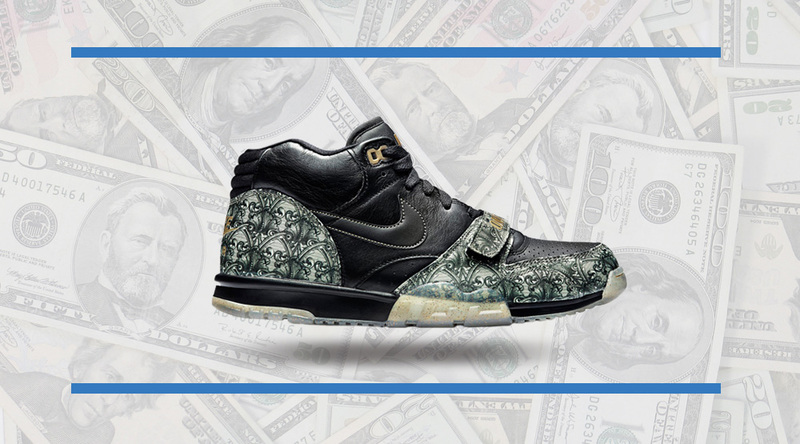 Celebrating Frazier as the modern American Dream, mita turned the legend into a $1000 dollar bill print for his signature sneaker. 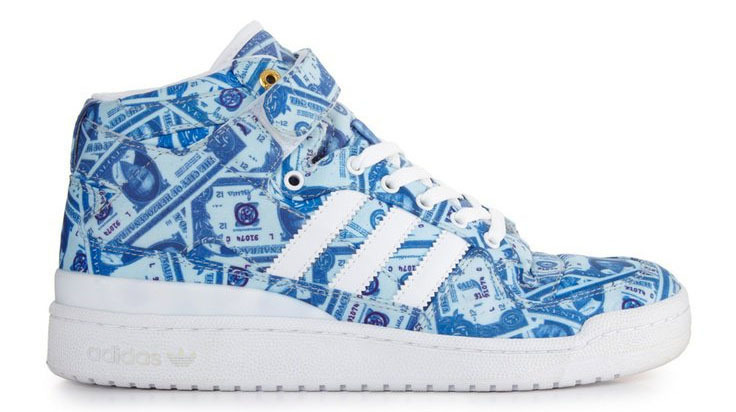 In 2007, adidas' Consortium range produced this blue spin on the "Money" Forum High, which was launched at Los Angeles' UNDFTD in limited quantities. 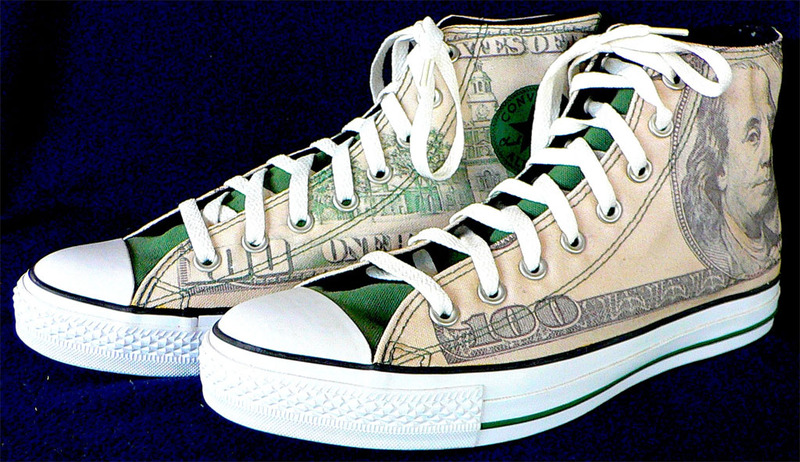 The irony here is that you can score two or three pairs of Chucks with a $100 bill. Ten years after his original money print adidas sneaker, Jeremy Scott paid homage with a similar make-up of his unorthodox Wings 2.0. And like the original, Scott's face is pictured on the dollar bills. As the NBA was preparing to take its All-Star festivities to Las Vegas, Reebok rolled out a money printed version of Allen Iverson's Answer 10. Iverson, who was set to make his first All-Star appearance for the Western Conference, didn't play due to injury. 5. 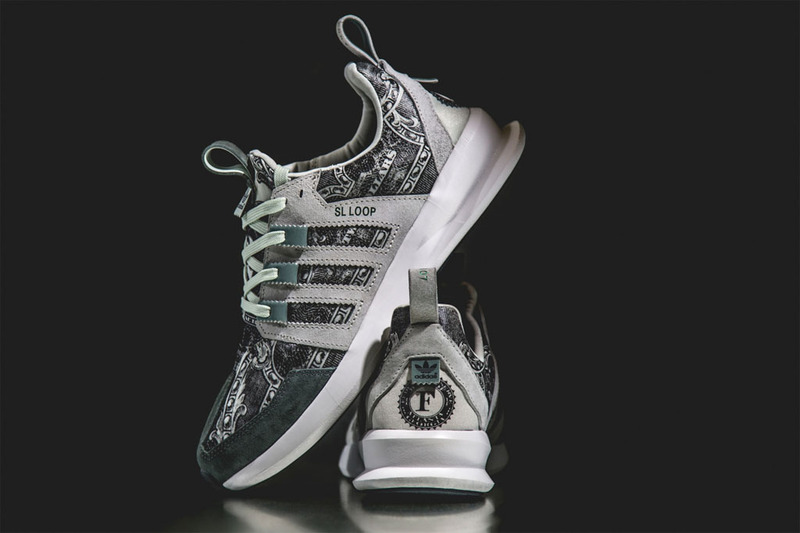 Wish x adidas SL Loop "Independent Currency"
The ultra-rare $2 bill is only printed at the Federal Bank in Atlanta, home to sneaker boutique Wish. Part of the SL Loop's launch, the bill-printed runner was a celebration of one of the city's unique qualities. 4. Futura x Livestrong x Nike Dunk High "FLOM"
Before Lance Armstrong was exposed as a fraud, his Livestrong Foundation had a 9-year partnership with Nike. In the midst of the union, Livestrong launched a project that saw 20 of the world’s greatest artists work on sneaker collaborations for charity. 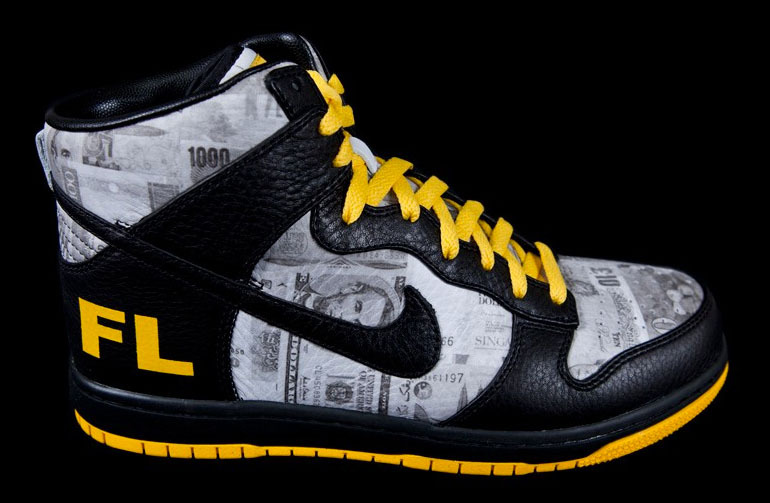 One of the participants was Futura, who resurrected the popular “FLOM” concept for a new Dunk in signature Livestrong colors. 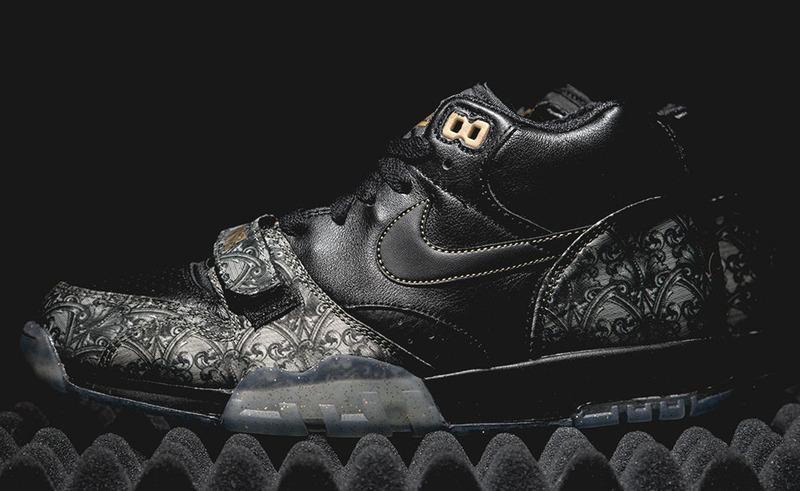 Given a tagline of “Look like money, feel like a million bucks,” the “Paid in Full” Air Trainer 1 skipped a straight up dollar bill print in favor of intricate details along the cross-strap, toe and heel. 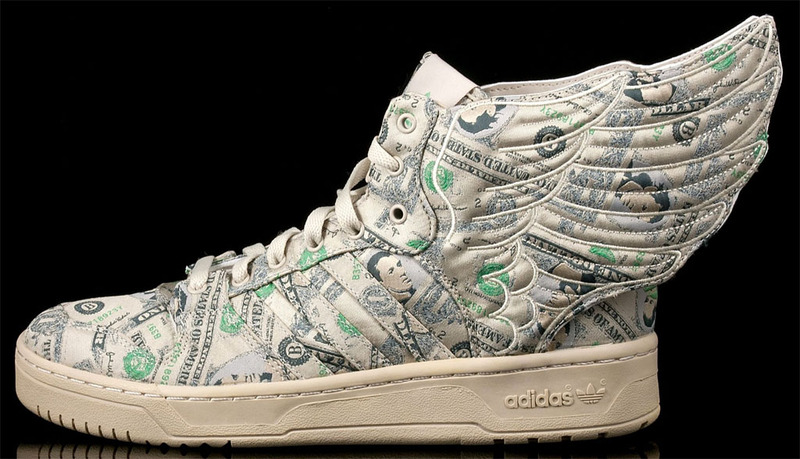 In 2003, Jeremy Scott designed the limited edition Money Forum Hi as part of the i-sign project. The shoe featured the classic dollar print in a silk fabric. Of the original idea, Scott said, "It was inspired by American television game shows and the concept of winning prizes like washing machines, luxurious vacations or a shopping cart full of cash." Celebrating the opening of his Fukuoka-based shop, Futura teamed up with Nike Skateboarding for the super limited “For the Love of Money” (or “FLOM”) Dunk in March 2004. 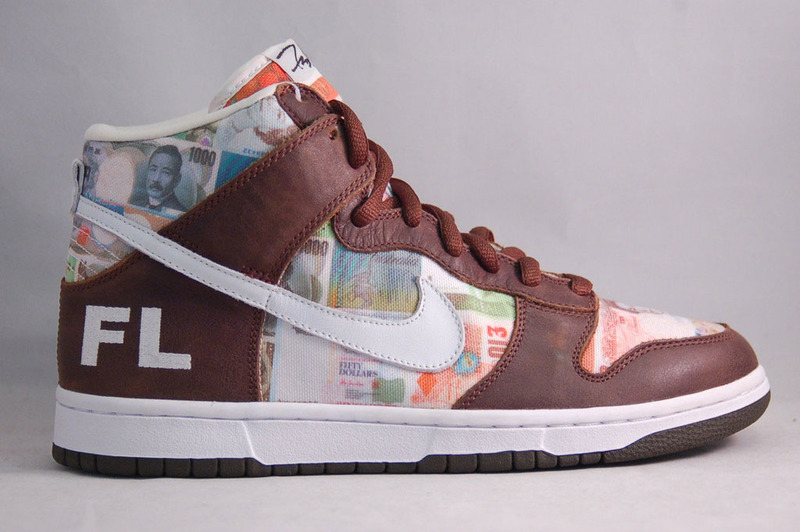 Addressing the global fascination with money, he styled the sneaker in brown leather and a print comprised of currencies from around the world. And with just 24 pairs in existence, the fact that it’s fetched $15,000 on the open market isn’t too surprising.